See the 56th Presidential Inauguration Official Program for today's events and maps for how to get downtown. 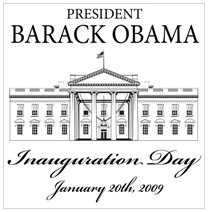 Be part of history and upload your photos to the Official Inaugural Book at Barack Obama Inauguration Book 2009 (a selection of photos will be included in the Official Inaugural Book). https://www.boston.com/bigpicture/2009/01/inaugural_preparations.html. Be sure to look at the Lego version of the oath of office.